Since its very first launch back in 1976 Honda Accord has several milestones to show. It’s been the most awarded car that has outranked even BMW. 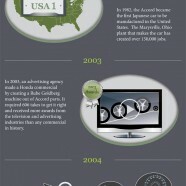 Have a look at some cool facts from the Accord legacy.